More than 300,000 hip fractures occur yearly, and almost all are treated operatively with internal fixation or prosthetic replacement. The number of orthopedic implants placed in the femur is increasing. Furthermore, the number of implants placed in other bones is increasing, with expanding indications for shoulder, elbow, and ankle replacement, and internal fixation continues to be used in all the long bones, especially the tibia and the humerus. Improvements in cancer treatment also have resulted in longer life spans with increased likelihood of metastatic bone lesions and impending or actual pathologic fractures that require internal fixation. The ability of tumor to "outgrow" a fixation device and the reduced ability of irradiated or tumor-replaced bone to heal fractures also result in an increasing frequency of peri-implant fractures. The implant may impair fracture healing because of endosteal ischemia. Rates of nonunion for supracondylar fractures proximal to total knee prostheses are higher than those for supracondylar fractures without the implant. Stems, rods, screws, and methylmethacrylate may block the medullary canal, preventing intramedullary fixation of fractures. Stems and rods also block screw fixation through the medullary canal to hold plates on bone. The techniques for treating peri-implant fractures may be more difficult, with more limited options and more frequent complications than the techniques used in treating fractures without the presence of an implant. Treatment of periprosthetic fractures requires strict adherence to the basic principles of treating any fracture. The surgeon must restore the biomechanical integrity of the bone. This requires restoration of a biologic environment in which the bone can heal and a mechanically stable construct to give the bone a chance to heal. Biology is maintained by strict soft-tissue and indirect reduction techniques, when possible, to preserve periosteal or endosteal blood supply. The surgeon should minimize periosteal stripping, avoid dead space, and consider bone grafting if the biologic environment is compromised. The patient's medical condition should be optimized. The patient should be encouraged to stop smoking when applicable. Mechanical stability is obtained by restoring the anatomic integrity of the bone and by following Arbeitsgemeinschaft für Osteosynthesefragen/Association for the Study of Internal Fixation (AO/ASIF) principles with adequate fixation distal and proximal to the fracture. Distal femur fracture during hip arthroplasty. A study by Sappey-Marinier et al compared dual-mobility (DM) cups (n = 73) with single-mobility (SM) cups (n = 53) to assess their relative effects on the incidence of dislocation and periprosthetic fracture in the setting of revision total hip arthroplasty. They found that the use of DM cups increased hip stability and reduced dislocation as compared with SM cups but also led to a higher rate of periprosthetic fracture through load transfer on the femur. Further studies with a larger cohort and longer follow-up would be needed to confirm these findings. Failed fixation caused by fracture through screw holes. The exact incidence and frequency of other peri-implant fractures have not been established. A good outcome and a favorable prognosis are expected if the surgeon restores the biomechanical function of the limb. Failure to do so results in a poor outcome. However, even with improved techniques and implant designs, these fractures remain challenging. When treating periprosthetic fractures, the surgeon must evaluate the stability of the implant carefully. Loose implants used for fixation allow motion at the fracture site that interferes with healing and physically interferes with the placement of more stable fracture fixation. Loose prostheses used for joint replacement are painful and interfere with adequate fracture fixation. If the implant is loose or malaligned, the implant should be revised while the fracture is fixed at the same setting. If the implant is stable and sufficient bone stock is available for fracture stabilization, the implant should be retained while the fracture is fixed according to standard treatment principles. When treating peri-implant fractures of the femur, the surgeon should have a flexible approach, using the best-fitting device, following basic fracture principles of rigid internal fixation and restoration of the anatomy and preservation of soft-tissue attachments. Anakwe RE, Aitken SA, Khan LA. Osteoporotic periprosthetic fractures of the femur in elderly patients: outcome after fixation with the LISS plate. Injury. 2008 Oct. 39 (10):1191-7. [Medline]. Chan LWM, Gardner AW, Wong MK, Chua K, Kwek EBK, Singapore Orthopaedic Research CollaborativE (SORCE). Non-prosthetic peri-implant fractures: classification, management and outcomes. Arch Orthop Trauma Surg. 2018 Jun. 138 (6):791-802. [Medline]. Total hip arthroplasty and total knee arthroplasty. Rosenberg AG, ed. Orthopaedic Knowledge Update 5. Rosemont, IL: American Academy of Orthopaedic Surgeons; 1996. 397,486. Singh JA, Jensen M, Lewallen D. Predictors of periprosthetic fracture after total knee replacement: an analysis of 21,723 cases. Acta Orthop. 2013 Apr. 84(2):170-7. [Medline]. [Full Text]. Cook RE, Jenkins PJ, Walmsley PJ, Patton JT, Robinson CM. Risk factors for periprosthetic fractures of the hip: a survivorship analysis. Clin Orthop Relat Res. 2008 Jul. 466(7):1652-6. [Medline]. Schwarzkopf R, Oni JK, Marwin SE. Total hip arthroplasty periprosthetic femoral fractures: a review of classification and current treatment. Bull Hosp Jt Dis (2013). 2013. 71 (1):68-78. [Medline]. Moloney GB, Toro JB, Helfet DL, Wellman DS. Proximal Periprosthetic Femur Fractures: Strategies for Internal Fixation. Am J Orthop (Belle Mead NJ). 2016 May-Jun. 45 (4):213-8. [Medline]. [Full Text]. Hartford JM, Knowles SB. Risk Factors for Perioperative Femoral Fractures: Cementless Femoral Implants and the Direct Anterior Approach Using a Fracture Table. J Arthroplasty. 2016 Sep. 31 (9):2013-8. [Medline]. Figgie MP, Goldberg VM, Figgie HE 3rd, Sobel M. The results of treatment of supracondylar fracture above total knee arthroplasty. J Arthroplasty. 1990 Sep. 5 (3):267-76. [Medline]. Sisto DJ, Lachiewicz PF, Insall JN. Treatment of supracondylar fractures following prosthetic arthroplasty of the knee. Clin Orthop Relat Res. 1985 Jun. (196):265-72. [Medline]. Culp RW, Schmidt RG, Hanks G, Mak A, Esterhai JL Jr, Heppenstall RB. Supracondylar fracture of the femur following prosthetic knee arthroplasty. Clin Orthop Relat Res. 1987 Sep. (222):212-22. [Medline]. Guild GN 3rd, Runner RP, Rickels TD, Oldja R, Faizan A. Anthropometric Computed Tomography Reconstruction Identifies Risk Factors for Cortical Perforation in Revision Total Hip Arthroplasty. J Arthroplasty. 2016 Nov. 31 (11):2554-2558. [Medline]. Curtin BM, Fehring TK. Bisphosphonate fractures as a cause of painful total hip arthroplasty. Orthopedics. 2011 Dec. 34(12):e939-44. [Medline]. Brand S, Ettinger M, Omar M, Hawi N, Krettek C, Petri M. Concepts and Potential Future Developments for Treatment of Periprosthetic Proximal Femoral Fractures. Open Orthop J. 2015. 9:405-11. [Medline]. [Full Text]. Ritter MA, Faris PM, Keating EM. Anterior femoral notching and ipsilateral supracondylar femur fracture in total knee arthroplasty. J Arthroplasty. 1988. 3 (2):185-7. [Medline]. Hoffmann MF, Jones CB, Sietsema DL, Koenig SJ, Tornetta P 3rd. Outcome of periprosthetic distal femoral fractures following knee arthroplasty. Injury. 2012 Jul. 43 (7):1084-9. [Medline]. Fitzgerald RH Jr, Brindley GW, Kavanagh BF. The uncemented total hip arthroplasty. Intraoperative femoral fractures. Clin Orthop. 1988 Oct. (235):61-6. [Medline]. Shaw JA, Greer RB III. Complications of total hip replacement. Epps CH Jr, ed. Complications in Orthopaedic Surgery. 3rd ed. Philadelphia: JB Lippincott; 1994. 1013-56. Johansson JE, McBroom R, Barrington TW, Hunter GA. Fracture of the ipsilateral femur in patients wih total hip replacement. J Bone Joint Surg Am. 1981 Dec. 63(9):1435-42. [Medline]. Abdel MP, Watts CD, Houdek MT, Lewallen DG, Berry DJ. Epidemiology of periprosthetic fracture of the femur in 32 644 primary total hip arthroplasties: a 40-year experience. Bone Joint J. 2016 Apr. 98-B (4):461-7. [Medline]. Potty AG, Corona J, Manning BT, Le A, Saleh KJ. Acute periprosthetic fractures of the acetabulum after total hip arthroplasty. Instr Course Lect. 2014. 63:199-207. [Medline]. Sappey-Marinier E, Viste A, Blangero Y, Desmarchelier R, Fessy MH. A comparative study about the incidence of dislocation and peri-prosthetic fracture between dual mobility versus standard cups after primary total hip arthroplasty. Int Orthop. 2019 Jan 5. [Medline]. Abdel MP, Houdek MT, Watts CD, Lewallen DG, Berry DJ. Epidemiology of periprosthetic femoral fractures in 5417 revision total hip arthroplasties: a 40-year experience. Bone Joint J. 2016 Apr. 98-B (4):468-74. [Medline]. Koval KJ, Frankel VH, Kummer F, Green S. Complications of fracture fixation devices. Epps CH, ed. Complications in Orthopaedic Surgery. 3rd ed. Philadelphia: JB Lippincott; 1994. 131-54. Wu CC, Shih CH. Ipsilateral femoral neck and shaft fractures. Retrospective study of 33 cases. Acta Orthop Scand. 1991 Aug. 62(4):346-51. [Medline]. Azer SN, Rankin EA. Complications of treatment of femoral shaft fractures. Epps CH, ed. Complications in Orthopaedic Surgery. 3rd ed. Philadelphia: JB Lippincott; 1994. 487-524. Chmell MJ, Moran MC, Scott RD. Periarticular Fractures After Total Knee Arthroplasty: Principles ofManagement. J Am Acad Orthop Surg. 1996 Mar. 4(2):109-116. [Medline]. Holley K, Zelken J, Padgett D, Chimento G, Yun A, Buly R. Periprosthetic fractures of the femur after hip arthroplasty: an analysis of 99 patients. HSS J. 2007 Sep. 3(2):190-7. [Medline]. Zuurmond RG, van Wijhe W, van Raay JJ, Bulstra SK. High incidence of complications and poor clinical outcome in the operative treatment of periprosthetic femoral fractures: An analysis of 71 cases. Injury. 2010 Jun. 41(6):629-33. [Medline]. Hou Z, Bowen TR, Irgit K, Strohecker K, Matzko ME, Widmaier J, et al. Locked plating of periprosthetic femur fractures above total knee arthroplasty. J Orthop Trauma. 2012 Jul. 26 (7):427-32. [Medline]. Platzer P, Schuster R, Aldrian S, Prosquill S, Krumboeck A, Zehetgruber I, et al. Management and outcome of periprosthetic fractures after total knee arthroplasty. J Trauma. 2010 Jun. 68(6):1464-70. [Medline]. Ozdemir G, Azboy I, Yilmaz B. Bilateral periprosthetic tibial stress fracture after total knee arthroplasty: A case report. Int J Surg Case Rep. 2016. 24:175-8. [Medline]. Fonseca F, Rebelo E, Completo A. TIBIAL PERIPROSTHETIC FRACTURE COMBINED WITH TIBIAL STEM STRESS FRACTURE FROM TOTAL KNEE ARTHROPLASTY. Rev Bras Ortop. 2011 Nov-Dec. 46 (6):745-50. [Medline]. Wada M, Imura S, Bo A, Baba H, Miyazaki T. Stress fracture of the femoral component in total knee replacement: a report of 3 cases. Int Orthop. 1997. 21 (1):54-5. [Medline]. Eschenroeder HC Jr, Krackow KA. Late onset femoral stress fracture associated with extruded cement following hip arthroplasty. A case report. Clin Orthop Relat Res. 1988 Nov. 236:210-3. [Medline]. Lotke PA, Wong RY, Ecker ML. Stress fracture as a cause of chronic pain following revision total hip arthroplasty. Report of two cases. Clin Orthop Relat Res. 1986 May. 206:147-50. [Medline]. Kanaji A, Ando K, Nakagawa M, Fukaya E, Date H, Yamada H. Insufficiency fracture in the medial wall of the acetabulum after total hip arthroplasty. J Arthroplasty. 2007 Aug. 22 (5):763-7. [Medline]. Nagoshi N, Yamanaka K, Sasaki T. Radial shaft stress fracture after internal fixation using a titanium plate. BMJ Case Rep. 2015 May 20. 2015:[Medline]. Cross MB, Nam D, van der Meulen MC, Bostrom MP. A rare case of a bisphosphonate-induced peri-prosthetic femoral fracture. J Bone Joint Surg Br. 2012 Jul. 94 (7):994-7. [Medline]. Curtin BM, Fehring TK. Bisphosphonate fractures as a cause of painful total hip arthroplasty. Orthopedics. 2011 Dec 6. 34 (12):e939-44. [Medline]. Bhattacharyya R, Spence S, O'Neill G, Periasamy K. Bisphosphonate-induced periprosthetic fracture: a cause of painful total hip arthroplasty. Case Rep Surg. 2014. 2014:631709. [Medline]. Robinson Jde D, Leighton RK, Trask K, Bogdan Y, Tornetta P 3rd. Periprosthetic Atypical Femoral Fractures in Patients on Long-term Bisphosphonates: A Multicenter Retrospective Review. J Orthop Trauma. 2016 Apr. 30 (4):170-6. [Medline]. Duncan CP, Masri BA. Fractures of the femur after hip replacement. Instr Course Lect. 1995. 44:293-304. [Medline]. Fleischman AN, Chen AF. Periprosthetic fractures around the femoral stem: overcoming challenges and avoiding pitfalls. Ann Transl Med. 2015 Sep. 3 (16):234. [Medline]. Vioreanu MH, Parry MC, Haddad FS, Duncan CP. Field testing the Unified Classification System for peri-prosthetic fractures of the pelvis and femur around a total hip replacement : an international collaboration. Bone Joint J. 2014 Nov. 96-B (11):1472-7. [Medline]. Videla-Cés M, Sales-Pérez JM, Sánchez-Navés R, Romero-Pijoan E, Videla S, 'Peri-implant Femoral Fractures Study Group'. Proposal for the classification of peri-implant femoral fractures: Retrospective cohort study. Injury. 2018 Nov 1. [Medline]. Apivatthakakul T, Phornphutkul C, Bunmaprasert T, Sananpanich K, Fernandez Dell'oca A. Percutaneous cerclage wiring and minimally invasive plate osteosynthesis (MIPO): a percutaneous reduction technique in the treatment of Vancouver type B1 periprosthetic femoral shaft fractures. Arch Orthop Trauma Surg. 2012 Jun. 132(6):813-22. [Medline]. Meneghini RM, Keyes BJ, Reddy KK, Maar DC. Modern retrograde intramedullary nails versus periarticular locked plates for supracondylar femur fractures after total knee arthroplasty. J Arthroplasty. 2014 Jul. 29 (7):1478-81. [Medline]. Kiluçoglu OI, Akgül T, Saglam Y, Yazicioglu O. Comparison of locked plating and intramedullary nailing for periprosthetic supracondylar femur fractures after knee arthroplasty. Acta Orthop Belg. 2013 Aug. 79(4):417-21. [Medline]. Park J, Lee JH. Comparison of retrograde nailing and minimally invasive plating for treatment of periprosthetic supracondylar femur fractures (OTA 33-A) above total knee arthroplasty. Arch Orthop Trauma Surg. 2016 Mar. 136 (3):331-8. [Medline]. Brand S, Bauer M, Petri M, Schrader J, Maier HJ, Krettek C, et al. Impact of intraprosthetic drilling on the strength of the femoral stem in periprosthetic fractures: A finite element investigation. Proc Inst Mech Eng H. 2016 Jul. 230 (7):675-81. [Medline]. Tosounidis TH, Giannoudis PV. What is new in distal femur periprosthetic fracture fixation?. Injury. 2015 Dec. 46 (12):2293-6. [Medline]. Blaster RB, Matthews LS. Complications of prosthetic knee arthroplasty. Epps CH, ed. Complications in Orthopaedic Surgery. 3rd ed. Philadelphia: JB Lippincott; 1994. 1057-88. Simon P, von Roth P, Perka C. Treatment algorithm of acetabular periprosthetic fractures. Int Orthop. 2015 Oct. 39 (10):1995-2003. [Medline]. Johnson-Lynn S, Ngu A, Holland J, Carluke I, Fearon P. The effect of delay to surgery on morbidity, mortality and length of stay following periprosthetic fracture around the hip. Injury. 2016 Mar. 47 (3):725-7. [Medline]. Stoffel K, Sommer C, Kalampoki V, Blumenthal A, Joeris A. The influence of the operation technique and implant used in the treatment of periprosthetic hip and interprosthetic femur fractures: a systematic literature review of 1571 cases. Arch Orthop Trauma Surg. 2016 Apr. 136 (4):553-61. [Medline]. Bates BD, Walmsley DW, Vicente MR, Kuzyk PR, Nauth A, Waddell JP, et al. An international, cross-sectional survey of the management of Vancouver type B1 periprosthetic femoral fractures around total hip arthroplasties. Injury. 2018 Feb. 49 (2):364-369. [Medline]. Gordon K, Winkler M, Hofstädter T, Dorn U, Augat P. Managing Vancouver B1 fractures by cerclage system compared to locking plate fixation - a biomechanical study. Injury. 2016 Jun. 47 Suppl 2:S51-7. [Medline]. Lenz M, Lehmann W, Wähnert D. Periprosthetic fracture fixation in osteoporotic bone. Injury. 2016 Jun. 47 Suppl 2:S44-50. [Medline]. Dehghan N, McKee MD, Nauth A, Ristevski B, Schemitsch EH. Surgical fixation of Vancouver type B1 periprosthetic femur fractures: a systematic review. J Orthop Trauma. 2014 Dec. 28 (12):721-7. [Medline]. Bae DK, Song SJ, Yoon KH, Kim TY. Periprosthetic supracondylar femoral fractures above total knee arthroplasty: comparison of the locking and non-locking plating methods. Knee Surg Sports Traumatol Arthrosc. 2014 Nov. 22 (11):2690-7. [Medline]. Walcher MG, Giesinger K, du Sart R, Day RE, Kuster MS. Plate Positioning in Periprosthetic or Interprosthetic Femur Fractures With Stable Implants-A Biomechanical Study. J Arthroplasty. 2016 Dec. 31 (12):2894-2899. [Medline]. Moloney GB, Westrick ER, Siska PA, Tarkin IS. 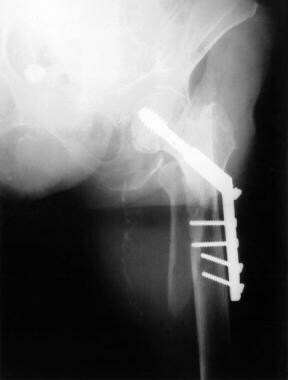 Treatment of periprosthetic femur fractures around a well-fixed hip arthroplasty implant: span the whole bone. Arch Orthop Trauma Surg. 2014 Jan. 134(1):9-14. [Medline]. Drew JM, Griffin WL, Odum SM, Van Doren B, Weston BT, Stryker LS. Survivorship After Periprosthetic Femur Fracture: Factors Affecting Outcome. J Arthroplasty. 2016 Jun. 31 (6):1283-8. [Medline]. Rahman WA, Vial TA, Backstein DJ. Distal Femoral Arthroplasty for Management of Periprosthetic Supracondylar Fractures of the Femur. J Arthroplasty. 2016 Mar. 31 (3):676-9. [Medline]. Windhager R, Schreiner M, Staats K, Apprich S. Megaprostheses in the treatment of periprosthetic fractures of the knee joint: indication, technique, results and review of literature. Int Orthop. 2016 May. 40 (5):935-43. [Medline]. Font-Vizcarra L, Fernandez-Valencia JA, Gallart X, Segur JM, Prat S, Riba J. Cortical strut allograft as an adjunct to plate fixation for periprosthetic fractures of the femur. Hip Int. 2010 Jan-Mar. 20(1):43-9. [Medline]. Jassim SS, McNamara I, Hopgood P. Distal femoral replacement in periprosthetic fracture around total knee arthroplasty. Injury. 2014 Mar. 45(3):550-3. [Medline]. Ebraheim NA, Kelley LH, Liu X, Thomas IS, Steiner RB, Liu J. Periprosthetic Distal Femur Fracture after Total Knee Arthroplasty: A Systematic Review. Orthop Surg. 2015 Nov. 7 (4):297-305. [Medline]. Ha CW, Shon OJ, Lim SW, Park KH. Minimally invasive plate osteosynthesis for periprosthetic distal femoral fractures after total knee arthroplasty. Knee Surg Relat Res. 2014 Mar. 26(1):27-32. [Medline]. [Full Text]. Kumar A, Chambers I, Maistrelli G, Wong P. Management of periprosthetic fracture above total knee arthroplasty using intramedullary fibular allograft and plate fixation. J Arthroplasty. 2008 Jun. 23(4):554-8. [Medline]. Talbot M, Zdero R, Schemitsch EH. Cyclic loading of periprosthetic fracture fixation constructs. J Trauma. 2008 May. 64(5):1308-12. [Medline]. Eingartner C, Ochs U, Egetemeyer D, Volkmann R. Treatment of periprosthetic femoral fractures with the Bicontact revision stem. Z Orthop Unfall. 2007 Sep-Oct. 145 Suppl 1:S29-33. [Medline]. Ricci WM, Borrelli J Jr. Operative management of periprosthetic femur fractures in the elderly using biological fracture reduction and fixation techniques. Injury. 2007 Sep. 38 Suppl 3:S53-8. [Medline]. Muller ME, Allgower M, Schneider R, Willenegger H. Manual of Internal Fixation. 3rd ed. New York: Springer-Verlag; 1991. 1-112. Large TM, Kellam JF, Bosse MJ, Sims SH, Althausen P, Masonis JL. Locked plating of supracondylar periprosthetic femur fractures. J Arthroplasty. 2008 Sep. 23 (6 Suppl 1):115-20. [Medline]. Ehlinger M, Bonnomet F, Adam P. Periprosthetic femoral fractures: the minimally invasive fixation option. Orthop Traumatol Surg Res. 2010 May. 96(3):304-9. [Medline]. Giesinger K, Ebneter L, Day RE, Stoffel KK, Yates PJ, Kuster MS. Can plate osteosynthesis of periprosthethic femoral fractures cause cement mantle failure around a stable hip stem? A biomechanical analysis. J Arthroplasty. 2014 Jun. 29 (6):1308-12. [Medline]. Xue H, Tu Y, Cai M, Yang A. Locking compression plate and cerclage band for type B1 periprosthetic femoral fractures preliminary results at average 30-month follow-up. J Arthroplasty. 2011 Apr. 26 (3):467-471.e1. [Medline]. Sariyilmaz K, Dikici F, Dikmen G, Bozdag E, Sunbuloglu E, Bekler B, et al. The effect of strut allograft and its position on Vancouver type B1 periprosthetic femoral fractures: a biomechanical study. J Arthroplasty. 2014 Jul. 29 (7):1485-90. [Medline]. Moore RE, Baldwin K, Austin MS, Mehta S. A systematic review of open reduction and internal fixation of periprosthetic femur fractures with or without allograft strut, cerclage, and locked plates. J Arthroplasty. 2014 May. 29(5):872-6. [Medline]. Mihalko WM, Beaudoin AJ, Cardea JA. Finite-element modelling of femoral shaft fracture fixation techniquespost total hip arthroplasty. J Biomech. 1992 May. 25(5):469-76. [Medline]. Schmotzer H, Tchejeyan GH, Dall DM. Surgical management of intra- and postoperative fractures of the femur about the tip of the stem in total hip arthroplasty. J Arthroplasty. 1996 Sep. 11(6):709-17. [Medline]. Lohrbach B, Rabin S. Biomechanical Analysis of Cable Plate Fixation of a Periprosthetic Femur Fracture in a Cadaveric Model. MidAmerica Association Annual Meeting. April. Lenz M, Perren SM, Gueorguiev B, Richards RG, Hofmann GO, Fernandez dell'Oca A, et al. A biomechanical study on proximal plate fixation techniques in periprosthetic femur fractures. Injury. 2014 Jan. 45 Suppl 1:S71-5. [Medline]. Darwiche H, Barsoum WK, Klika A, Krebs VE, Molloy R. Retrospective analysis of infection rate after early reoperation in total hip arthroplasty. Clin Orthop Relat Res. 2010 Sep. 468 (9):2392-6. [Medline]. Ristevski B, Nauth A, Williams DS, Hall JA, Whelan DB, Bhandari M, et al. Systematic review of the treatment of periprosthetic distal femur fractures. J Orthop Trauma. 2014 May. 28(5):307-12. [Medline]. Zdero R, Walker R, Waddell JP, Schemitsch EH. Biomechanical evaluation of periprosthetic femoral fracture fixation. J Bone Joint Surg Am. 2008 May. 90(5):1068-77. [Medline]. Tomás Hernández J, Holck K. Periprosthetic femoral fractures: When I use strut grafts and why?. Injury. 2015 Nov. 46 Suppl 5:S43-6. [Medline]. Fracture around loose prosthesis treated with replacement. Fracture at the end of implant treated with replacement. 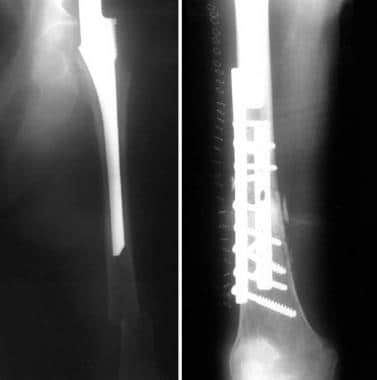 Fracture around stable prosthesis treated with flexible rods. Fracture around plate implant treated with rigid rod. Fracture around stable prosthesis treated with rigid rod. Fracture around stable prosthesis treated with standard plate. Fracture around stable rod implant treated with plate. Fracture around plate treated with a rod (pathologic). Open reduction and internal fixation with 2 "combi" fixed-angle locking screw plates (anterior and lateral placement to help control both anterolateral and mediolateral forces). Fracture around stable implant treated with less invasive stabilization system (LISS) plate. Failed periprosthetic repair (total hip above, total knee below). Vancouver B1 fracture treated with locked plate. Vancouver B1 fracture at tip of well-fixed hip replacement stem. Vancouver B1 fracture treated with locked plating technique. Periprosthetic fracture at stem of hip replacement with insufficient proximal bone for internal fixation. Periprosthetic fracture at stem of hip replacement with insufficient proximal bone for internal fixation; proximal femur replacement prosthesis with internal fixation. Healed third periprosthetic fracture after minimally invasive locked plating.